The network versions offer simple, economical installation, using Network Time Protocol (NTP) Ethernet networking technology and RJ45 style connectors via an existing local area network and ensure access to the correct and legally-traceable time information. 4000N series clocks can be automatically synchronised via NTP from a local or internet time server with automatic seasonal time changes and programmable time-zone offset. NTP is a time synchronisation protocol for inconsistent latency, packet-switched, computer networks. It abides by Coordinated Universal Time (UTC) standard. Additionally, the clocks may be used as stopwatch, programmable timer or up/down time counters when controlled with supplied infrared handsets or via network messages on N or NE versions. All may be used either as master clocks, as slave clocks controlled using a variety of network protocols or as stand-alone units, operating from their internal, high stability, quartz crystal oscillator. 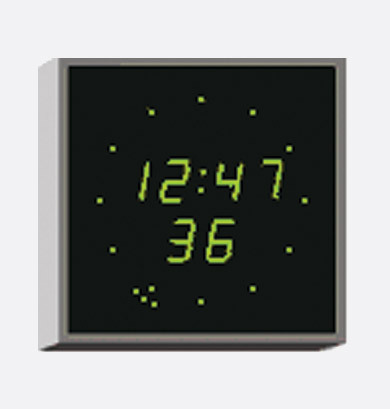 N (Network) versions of 4000 series clocks and calendar clocks can be used as stand-alone, slave or secondary displays. They have a 10/100Base-T Ethernet NTP interface port and can be synchronised with a Wharton 5000 series or other local or remote NTP network time-server across a TCP/IP Ethernet network, see Wharton Clocks - NTP Time Servers - Ethernet - 5000 Series. They can be configured, managed and updated remotely across the Ethernet TCP/IP network using the free Wharton cMon software. Fully automatic configuration is supported when used with a DHCP server with option 42 configured. They can be used as master clocks - one clock can control up to 5 similar units. 4000E versions are normally powered from an internal 110-230V 50-60Hz AC mains supply. The power lead has a UK plug. Power over Ethernet (PoE) is available as an option, as well. PoE operation powers the clock via the standard Cat-5 cable using IEEE 802.3af power injectors. Large clocks are supplied with 110-230V AC power supplies. PoE Midspan and Endspan support may be available (need to be specified when ordering). A non-rechargeable internal Lithium (Li) battery provides a standby supply to maintain the time-keeping in case of a power supply interruption for approximately 1 year and can be easily replaced. 24V DC operation is available as an extra cost option. Calendar clocks can display the date using one, two or three selections from 21 languages. Catalan, Croatian, Czech, Danish, Dutch, English, Faroese, Finnish, French, Galician, German, Hungarian, Italian, Norwegian, Polish, Portuguese, Russian, Slovene, Spanish, Swedish or Welsh. 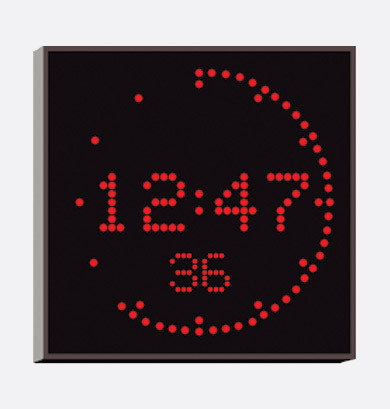 The clocks have the ability to display alternative languages sequentially automatically.